Kia Ora and welcome to your New Zealand experience. We are please to present to you with a look book showcasing the very best accommodation, activities and transportation on offer throughout New Zealand. We have also included the very best golf courses across the country. This was curated and put together by our golf obsessed Eighth Wonder Travel experts. 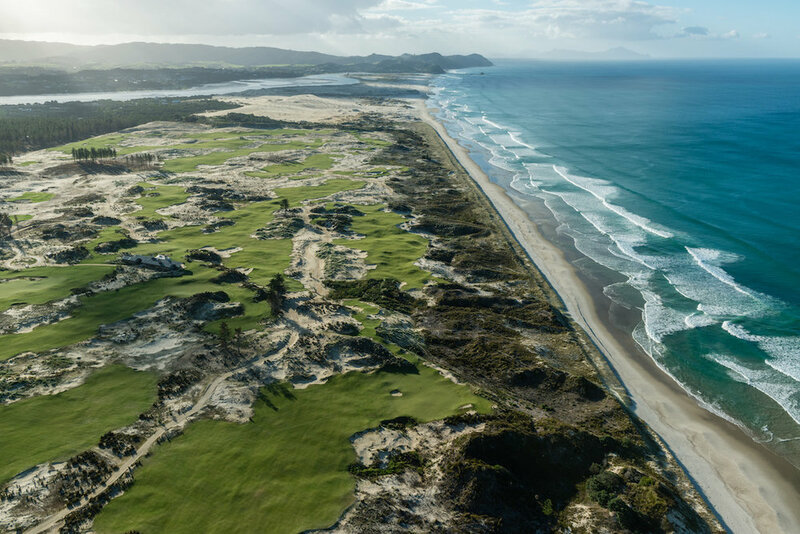 New Zealand is not only home to world-class golf courses. It is also the perfect playground for once-in-a-lifetime experiences. The next steps are to create an Eighth Wonder Travel account and schedule a call to run through this showcase, and discuss pricing before confirming accommodation and golf options. Then the process of selecting in the experiences around golf, and confirming transport comes next before the final polish and getting your custom itinerary out. We would love to host you throughout this fantastic journey. Nga mihi nui, with best wishes. The Eighth Wonder Travel Team. Just a 45-minute flight north of Auckland is the stunning Bay of Islands, one of NZ’s top tourist drawcards. With its unspoiled coastline, beautiful sandy beaches, turquoise waters and 144 untouched islands, this region enjoys a subtropical climate, and so you can expect warm weather year round.The Bay of Islands Maritime Park is one of New Zealand’s best loved destinations, offering world-class diving and snorkeling, with an array of wildlife including, dolphins, whales, penguins and gannets. It also has great sailing, kayaking and big-game fishing. Not only is the region blessed with stunning natural beauty, it has enormous historical significance, as the site of New Zealand’s first permanent British settlement and the birthplace of European colonization in the country. Kauri Cliffs is a stunningly beautiful 5,400-acre estate, set on a remote plateau, high above the Pacific Ocean. It is home to one of the world’s most renowned golf courses, with most holes offering amazing views of offshore islands and the magnificent Pacific Ocean. Besides golf, the estate provides many other activities, including swimming, hiking, horseback riding, hunting, fishing and sailing. Kauri Cliffs is a sister property of Cape Kidnappers and Matakauri Lodge. The Landing is located in a unique heritage and conservation property in the Bay of Islands, comprising a thousand acres of rolling hills, beaches, wildlife sanctuaries and historic sites. The Residences at The Landing are a group of privately owned houses, offering premium luxury and comfort in unparalleled surroundings, all tucked away in your own private bay. The houses range in size, and can sleep between four and 12 people. Situated just 1 hour north of New Zealand's largest city Auckland, Tara Iti was the brainchild of american investor Rick Kayne. The accommodation surrounds the golf course, and is designed by the renowned group; Cheshire Architects. Each cottage is a highly futuristic structure design, with glazed walls and two internal pod structures. 11 cottages consist of ONE and TWO bedrooms. With its picture-postcard setting on the shores of the 240-square-mile volcanic crater lake from which it gets is name, Taupo (pronounced Toe-Pour) is one of the North Island’s premier resort towns. It has an abundance of great hikes, and is the jumping-off point for the famous Tongariro Alpine Crossing. The impressive Huka Falls are nearby, which also has great nature walks. Located at the geographic center of the North Island, the region is one of the most pure, beautiful and unspoiled parts of the country and is home to some of New Zealand’s most dramatic and spectacular forests. It is also a magnet for fly-fishing, and is emerging as one of the country’s most popular cycling destinations, both road and off-road. Set in the tranquil, 630-acre grounds of the Kinloch Club course, on the shores of Lake Taupo, The Lodge at Kinloch is modern, uber-luxury accommodation at its best. The brief for its design was to emulate its namesake Scottish castle, but with a modern 21st century twist. The main lodge, with local schist stone exteriors, features dramatic framed vistas of the sensational views of the golf course and the ever-changing lake. A short stroll from the lodge are the luxury one- and two- bedroom villas and one-bedroom junior suites, which are ‘quiet’ in design and harmonize with the magnificent natural setting of this 18-hole lakeside links course. An hour’s flight southeast of Auckland is Hawke’s Bay, a region of diverse and magnificent landscapes, from mountains and hill country down to inland and coastal plains. Blessed with fertile, alluvial soils and a warm temperate climate, Hawke’s Bay is home to hundreds of farms, orchards and vineyards, making it New Zealand’s agricultural powerhouse. For the tens of thousands of visitors that flock to the region each year, it’s the food and wine that are the biggest drawcards, and with good reason, as the Hawkes Bay produces some of the best of both the country has to offer. On the coast, sits the town of Napier, one of New Zealand’s busiest commercial ports and host to a growing number of cruise ships. It’s also the country’s Art Deco capital, having been almost completely rebuilt in the Style Moderne after a devastating earthquake in 1931. Set atop 6,000 rolling acres of stunning pastureland, The Farm at Cape Kidnappers affords spectacular 180-degree views of the Pacific Ocean. The cluster of luxury lodges at Cape Kidnappers are suggestive of a working farm – a marriage of river stone and weathered wood – and are the perfect setting for relaxation, seclusion, or romantic breakaways. Inside, the lodges combine rustic and textured materials with comfortable modern furniture. The are 22 suites available on the property, as well as the Owners Cottage, which is also available upon request. Black Barn Retreats offers 16 unique properties scattered throughout the Hawkes Bay region. The houses are all fully self-contained and exclusively yours during your stay. Each has its own character and their locations are varied, such as coastal, vineyard, riverside and rolling hill backdrops. Every property is luxuriously appointed to reflect its individual character – from an eight-bedroom luxury retreat, to an intimate two-bedroom cottage in the heart of a vineyard. Take your pick – Black Barn Retreats offers an array of unique experiences. The Vineyard Cottages offer boutique accommodation with either 1 or 2 bedrooms each with their own private terrace overlooking the vineyard. The cottages have well-appointed kitchens and living areas, all with free standing wood burners to keep you warm amongst the vines. Wheelchair access is available in one of the cottages. he Lodge at Craggy Range features four stylishly appointed king bedrooms, each with ensuite, spacious open-plan living and chef's kitchen. The formal living area offers views to Te Mata Peak with dining and sitting areas by an impressive open fire-place. The lodge, set in lush green surroundings, sits high above the Tukituki Valley with generous views from each of the bedrooms. About two-thirds of the way down the South Island, in the middle of the Sourthen Alps, sits Lake Wakatipu, and on its shores, Queenstown. If ever a town deserves its reputation as the world’s adrenalin capital, surely this place does. You can bungee jump off bridges, or even out of a helicopter, take a jet boat ride through white-water canyons, heli-skiing in virgin powder snow, go extreme mountain biking, zip-line through valleys, and paraglide off mountains – you name, you can do it in Queenstown. There is, however, a more gentile side to Queenstown – one that includes luxurious, world-class lodges, superb wineries, great restaurants and scenery to die for… and five international-standard golf courses. This picturesque lakeside town has it in spades, whatever the season, whatever the activity. It absolutely must be part of any itinerary when visiting New Zealand. Since opening its doors in late 2010, Matakauri Lodge has received rave reviews, including Conde Nast Traveler rating it in the top 124 hotels in the world. Matakauri is a small, boutique hotel, with lodge-style accommodation, that provides the perfect private hideaway just a 30-minute drive from Queenstown along the stunning shores of Lake Wakatipu. With views of the Remarkables and the lake, this luxury lodge has it all. Matakauri is a sister property of Kauri Cliffs and Cape Kidnappers Lodge. In the late 1800’s Eichardt’s Private Hotel was born as a result of a rich vein of gold, that drew many prospectors and opportunists from around the globe to the shores of Lake Wakatipu. Over 120 years on, and this iconic hotel still commands a majestic position, right on the shores of the lake, in the center of Queenstown. Eichardt’s is split into three separate types of rooms: suites, apartments, and the residence. All apartments have stunning views over the lake and mountain ranges. New Zealand's national airline is the domestic carrier that will shuttle you effortlessly around this beautiful country. Their excellent safety record ensures you will be in good hands on every leg of your journey. Enjoy all ground transfers in comfort within the Mercedes Sprinter 313 CDI model. These late model vehicles include air conditioning, leather seats and stereo bluetooth with plenty of room for groups.